25 October / A large-scale mural titled “Gateway to Karlova” by Katrin Piile now decorates the façade of Kalevi 10 in Tartu. The making of the artwork was supported by the Tartu smart city project SmartEnCity. All pilot area buildings that will be renovated in the SEC project will not only become smart but also eye-catching. The artwork on Kalevi 10 got its inspiration from the building’s unique location – it borders the downtown and Karlova districts of Tartu. Katrin Piile is a well-known Estonian painter and artist whose style the building association and residents of Kalevi 10 judged to be just right for their house. The artist said that she was inspired by the location of the building. “My inspiration came from an aerial photograph of Karlova by the Estonian street artist Sänk. The sketchy lines of the street turn into a rainbow in the distance. The use of semitones in the colors was inspired by Karlova’s long history and its old wooden buildings that have lost their bright colors over the decades,” commented artist Katrin Piile. According to Andra Somelar, the SmartEnCity art project coordinator, art on or around pilot area buildings is an inseparable part of the project. “It helps highlight our smart hrustsovkas or smartovkas in the city space. These large-scale original artworks will enrichen the urban space and make the Tartu downtown area more cheerful and unique,” Somelar commented. She added that the art also helps to recognize the capable pilot area building associations who have embarked on the challenging renovation journey. The artists participating in the project were selected already in 2016 with an international art competition that brought participation requests from more than 50 artists from Estonia and abroad. Each building association together with their curator will choose the artist that will be working on their house. Katrin Piile’s artwork was curated and mediated by Andra Orn, the art curator of Kalevi 10 and the co-founder of Noar.eu, the largest online art sales environment in the Baltics. “Noar decided to participate in this interesting public space project in order to highlight the works of Estonia’s own artists and help preserve the individual character of urban space. Usually the artists who create these kinds of artworks travel from one street art festival to another, which as a result makes all cities look alike,” Orn commented. Kalevi 10 is the second SmartEnCity building to receive its artwork. 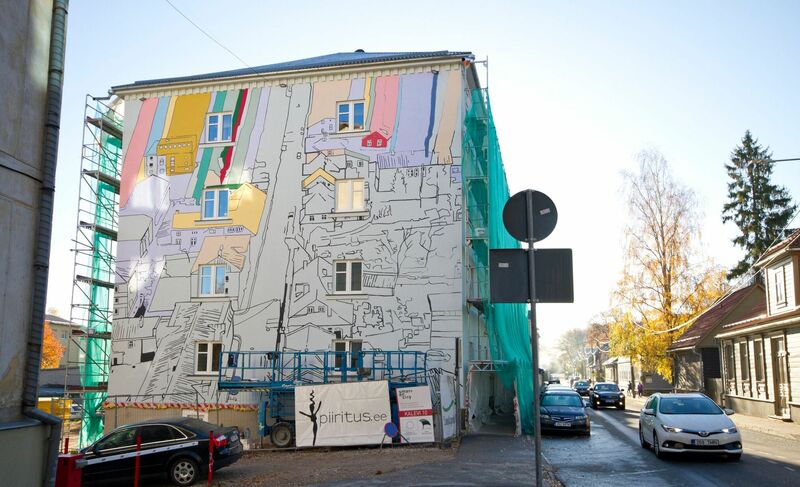 The first was Pepleri 10, whose painting by Andrus Peegel, an Estonian graphic, illustrator and artist, was painted on the building’s end wall this summer. Both artworks were realized by the art crew Piiritus led by local artist Edgar Tedresaar.